Spacious 4 bedroom, 2 bathroom house on 100 acres. The perfect rural getaway. Brenchley Farm is perfect for families, friends or couples looking for a special getaway. It's your country retreat in the heart of the Southern Highlands offering peace and tranquility, comfort and convenience. Enjoy the modern, well equipped, 4 bedroom, 2 bathroom home set on 100 acres of picturesque farmland. There's accommodation for a maximum of 8 adults or up to 10 people including children (2 queen rooms - 1 with ensuite, 1 double room, and 1 king single bunk room including a double sofa bed). All rooms have large windows to showcase the rural views, and most have sliding doors opening onto the verandah. High quality linen and towels are provided for your comfort so don't need to bring them with you. You'll enjoy the convenience of arriving to made up beds ready to sleep in. The living area has an open plan layout with a 8 seat dining table plus 2 lounge areas set around a central, double sided glass enclosed fireplace. We provide all the firewood for your stay. The kitchen bench has 3 stools, so up to 11 people can eat at the same time inside. You may choose to eat outside where there's a huge table so you can enjoy the views while you dine. There's even a Nespresso machine for your morning coffee. The heated floors, additional gas heating and thermal curtains will keep you warm in winter, and there is a verandah all round and outdoor dining for up to 10 people to enjoy during the warmer months. 3 of the 4 bedrooms also have additional wall mounted electric heaters (on safety timers) for the winter nights. We include a self catering hot breakfast for your first morning including bacon, eggs, cereal, milk, juice, and bread for toast. This takes the hassle out of your first morning, which is especially convenient if you have arrived late on Friday night after work. We provide tea, coffee, butter, jam, sauces, mustards and cooking essentials like olive oil, garlic, vinegar, salt, pepper etc that you'll need during your stay. There are lots of things to do at and around Brenchley Farm, or you may just choose to do nothing at all. There is plenty of space around the house with huge lawns for you to get out and about, and for the children to play. There's a fenced yard with a sandpit for the young ones, and a football field in the front yard for the older ones. There are 3 modern TVs & a Blu Ray player, plus a PS3 with a couple of games (you can always bring more) in the bunk room. The main lounge has a well stocked drawer of DVDs for you to enjoy during your stay. There are loads of kids movies to keep the little ones entertained while you enjoy an evening glass of wine by the fire. There's no wifi so the kids will be happy to get outside and explore, but there is good Telstra and Optus mobile reception so you can bring your mobile broadband or hot spot if you need connectivity. It's a 15 minute drive to the cafes & galleries of Robertson Village, and 30 minutes to the beaches & seaside town of Kiama. Most of the towns and villages of the Highlands (including Bowral) are within an easy 30 minute scenic drive. So you can choose from wine tasting, dining, shopping or browsing the many antique stores & galleries. It's all an easy 2 hour drive from Sydney on quality sealed road all the way. We (Sue and Anthony) live in Coogee in Sydney, and originally bought the farm as our weekender in 2003. In 2006, when we had our second child, we moved down to the farm intending to live there for a year or so, but loved it so much we ended up staying for 5 years. We loved the freedom the kids had living at the farm, and all the space for them to safely roam. We're back in Sydney now and our boys are teenagers, but we still get down to the farm as often as we can . We're happy to be able to make our country home available for other families to enjoy. When we bought the house it was in need of a renovation, but we loved it's solid concrete structure, large spacious rooms, and huge windows looking over the farm. The verandah all round was also a bonus as it keeps the house cool in summer, gives you somewhere lovely to sit, and was great when the kids were little as they could play outside even if it was raining. The locals thought we were crazy when we turned a good cattle paddock in to our huge front lawn, but we love the space it's given us. 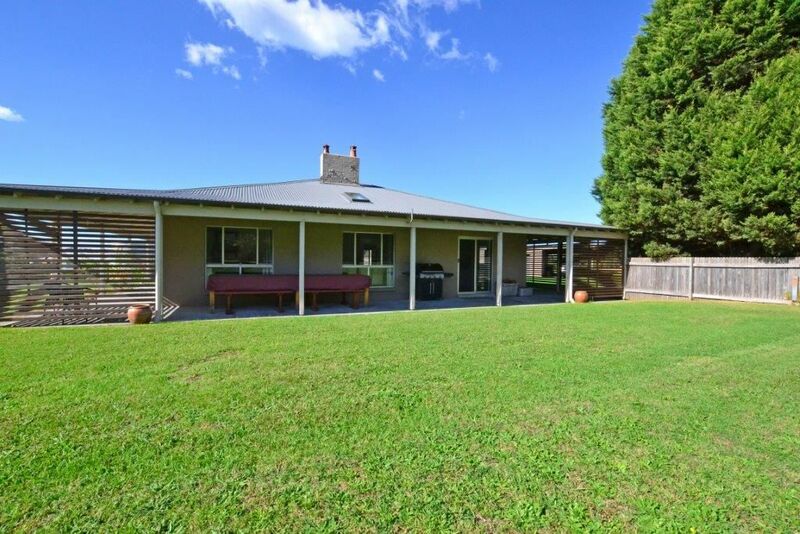 The location is great with the Kangaroo river flowing through the property before it goes over nearby Carrington Falls (90m drop) on it's way to Kangaroo Valley. The Buderoo National park is an easy 5 min walk and has loads of trails to enjoy. It's a lovely quiet location on a country lane but still close to towns, shops and services if you need them. Underfloor heating in kitchen, dining room and ensuite. Gas heating in living area. Electric heating in bedrooms. Double sided glass enclosed wood burning fire. All wood provided. PS3. Bring your own games. House was perfect for our group of 6 adults and 4 children. Loved the location close to Carrington Falls and Nellie's Glen, plus the amenities (and pies) of Robertson. Anthony and Sue also arranged for the kids to feed the animals which was thoroughly enjoyed. Thanks for a lovely stay. The farm is well set up, clean and comfortable in a peaceful location. With lots of space in the house and outside we could enjoy our time together with lots of choice of entertainment. The grandchildren liked their room with double bunks and all the rest of us (6 adults) slept peacefully and comfortably. Even though it was quite chilly and wet at times outside we were warm inside. Animal feeding (thanks Nat! ), walks, bike rides, footy on the grass and local sights gave plenty of variety. Nobody could possibly be bored at but it was also easy to be lazy if that suited. Sue and Anthony (owners) provided all needed details and support by mobile if needed (reception is patchy in this area for some providers). An easy drive from Sydney and only short drive to Robertson for any last minute supplies. Thanks for a great long weekend!! A tranquil and beautiful spot with a comfortable house. We loved our week at this property. The house is very comfortable and had everything that we needed for our group of 7 adults and 2 children. We loved wandering amongst the animals and feeding the sheep and lambs. We enjoyed local bushwalks, trips to Kiama and Bowral, sitting around the cosy wood fire etc. It was a great stay in a beautiful location. Anthony, the owner left us plenty of food for breakfast and arranged for the kids to feed the animals. We went for a walk to Carrington Falls and the view was spectacular. Lots of space in the house with a great fireplace. Property is very quiet, great animals, very warm, set up well. Water pressure was an issue at the beginning of the stay, but the owners let us know what to do to fix it. We will return, it was fantastic for our group!